Using Yard signs for video services may seem like a stretch, but they can be a great way to advertise video transfers and other consumer services! 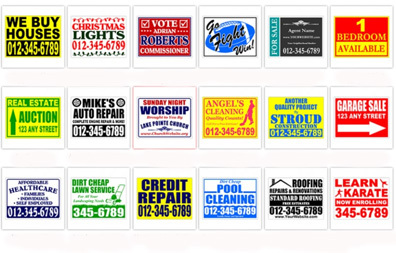 Lawn signs are used for local advertising, most commonly in real estate and election campaigns. But some of our customers who do video transfers business report good success with them. They are cheap enough that you can experiment. Prices start at $12.05 from Vistaprint. They are also available from Staples and others. Vistaprint allows you to buy just one to start. Yard signs are small when viewed from a moving car. Vistaprint only offers two sizes 27″ x 18″ and 18″ x 12″. So the sign needs to be simple and very easy to read. Five words or less. The most effective signs are one, maybe two lines of message and a direction, such as a phone number or an arrow. Forget about using your company logo unless many people will recognize it. It’s best to advertise just one specific service such as FAST OIL CHANGE – $19.99 with phone number/and or street address or shortened web address. Use a Sans Serif font like Ariel, or Verdana. These open fonts are easier to read. 30-40% white space. The more white space, without wasting space, the better. Use black, red, blue or brown on a white background. Use yellow on a black background. Use white on a blue, green or red background. The best places for yard sign are where there is high traffic volume and that traffic must stop, perhaps for a traffic light. One occupational hazard of yard signs is that many of them may be removed. In my town one of the main roads into town was the road my printer lived on. Since I do so much business with the printer, he offered to put one of my yard signs in his yard. In some cases you might do better tacking a poster (yard sign without legs to a post. Study what others do in your area. But don’t go by the placements of political yard signs. Those yards are probably owned by supporters of that particular candidate. Yard signs For video services can an inexpensive, but surprisingly effective marketing technique.